One of my unofficial goals is to blog my works-in-progress every single Wednesday this year. Doing a little research, I found that 2011 has exactly 52 Wednesdays in it. So let’s get started, shall we? After the insanity which was December, I’ve decided to take things a little easy in January. 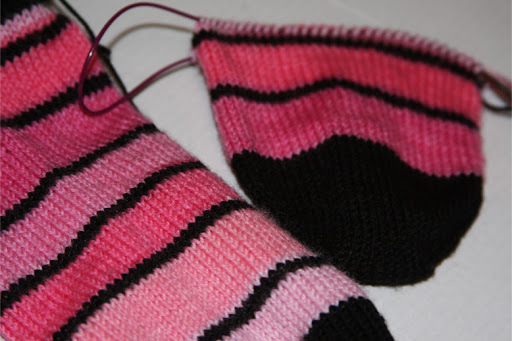 I’m slowly working on a pair of a-little-too-long-to-be-ankle socks. One is finished and the other is starting to take shape. These should be an FO before next Wednesday. I really like these socks. The colors make me happy.